Zimbabwean opposition official and former finance minister Tendai Biti has urged President Cyril Ramaphosa to intervene in the country’s economic and political crisis, which has left three people dead. The country went into a violent shutdown after the biggest trade union called a strike against a more than 100% increase in the price of fuel to a staggering $3.11 (R42.83) per litre for diesel, and $3.33 for petrol. This is more than three times the price of petrol in SA. The fuel hike gave Zimbabwe, one of the poorest countries in the world, the dubious honour of having the highest fuel prices in the world, heaping more misery on a population struggling with a shortage of foreign exchange that has seen the country run short of basics such as bread. Zimbabwe’s information minister Monica Mutsvangwa on Tuesday said the three people killed included a police officer. As the biggest country in the Southern African Development Community (Sadc), SA was "the big brother. It cannot pretend to be otherwise," Biti said in an interview on Tuesday. "I don’t know how many dead bodies Sadc wants to see before they will move on what is clearly a crisis. The lives of African people matter, and they should matter to the Sadc. Biti is the deputy national chair of the Movement for Democratic Change (MDC), which the Zimbabwean government has blamed for the latest violence. The MDC unsuccessfully challenged the outcome of elections held in July 2018, alleging that the governing Zanu-PF victory had been secured via vote rigging. Emmerson Mnangagwa, who seized power from Robert Mugabe with the help of the army in 2017, was declared the winner of the presidential race with 50.8% of the vote, compared to 44.3% for MDC leader Nelson Chamisa. Mnangagwa was in Russia on Tuesday to meet President Vladimir Putin and told state-owned RIA Novosti news agency that he would ask for loans from Russia. Mnangagwa did not say how much Zimbabwe wanted to borrow, and encouraged Russian companies to explore for gas and oil in the country. He is also scheduled to attend the World Economic Forum in Davos, Switzerland next week. "The bottom line is that we are being led by a rogue regime, following a sham election," Biti said. Ramaphosa "and his fellow Sadc member presidents must show leadership here." The crisis in Zimbabwe was not a foreign-affairs issue for SA because the consequences "will be directly visited" on the country, he said. Ramaphosa met with Chamisa just over two weeks ago. The opposition leader said he had sought the SA leader’s help in addressing Zimbabwe’s economic crisis. While Chamisa posted about the meeting on Twitter, the presidency did not issue any statement about it, and has not commented on calls for Ramaphosa and the Sadc to force the Zimbabwean government to accept mediation, referring queries to the department of international relations & co-operation. 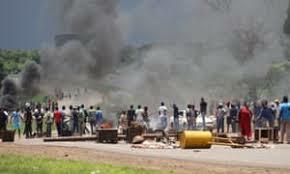 Protesters barricaded roads and burned tyres in Zimbabwe on Monday January 14 2018 as anger over the worst economic crisis in decades spilled onto the streets. Neither the department, nor the Sadc responded to requests for comment. The Zimbabwe Association of Doctors for Human Rights said on Tuesday that 13 people had sustained gunshot wounds in and around Harare. At least 200 people were arrested. Zimbabwe’s mobile phone networks and internet were partially shut down, with one industry source saying the systems had been jammed, with many users complaining of limited access. Zimbabwe's economy has been in crisis since hyperinflation wiped out savings between 2007 and 2009, when the Zimbabwean dollar was abandoned in favour of the US currency. Zimbabweans mainly rely on electronic payments as US dollar notes are in short supply. The local "bond note" currency, introduced in 2016, is little trusted and falling in value.